Wing, Dinged: A year after they met in the NHL’s first afternoon game, Detroit and Chicago met in the Stanley Cup Finals. That’s Detroit’s Herbie Lewis taking the fall here, in the first game of the series, won (like the Cup itself) by Chicago. 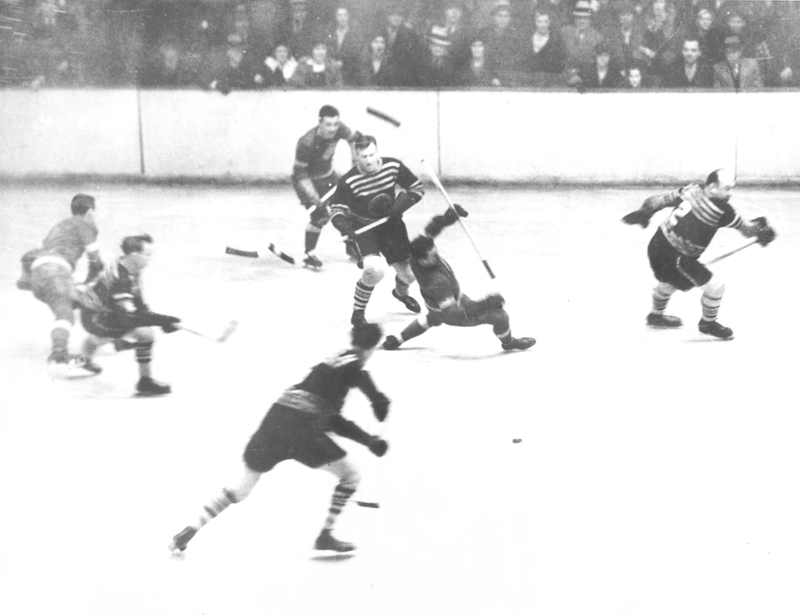 At right, numbered 2, is Chicago defenceman Taffy Abel. 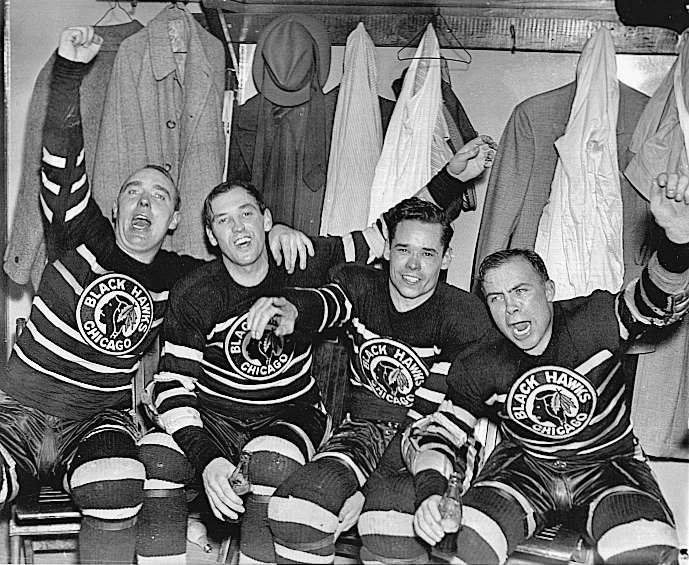 The Chicago Black Hawks weren’t going anywhere on this date in March of 1933 — they already knew they’d be missing the Stanley Cup playoffs as they limped into the last weekend of the NHL regular season. 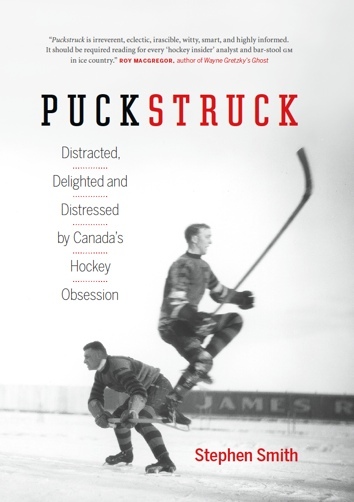 Beset by injuries and under investigation, they might have been looking forward to the cease of hockey as a mercy that couldn’t come soon enough. Still, that March 19, the Black Hawks did have one last home game to play, and they made history playing it. That Sunday, along with the visiting Detroit Red Wings, Chicago took part in the first afternoon game in NHL history. About 6,000 spectators showed up for a game that faced-off at 3.30 p.m. instead of the usual 8.30. When it came to the gate, that was a better number than the last time the Hawks had played at Chicago Stadium, earlier in March, when they beat the Ottawa Senators in front of a crowd of just 3,000. Two days before that, at their previous (nighttime) Sunday game, the crowd that saw them fall to the Toronto Maple Leafs was 7,000. A few other notes from the Detroit game: the first-place Red Wings prevailed on the afternoon by a score of 4-2, getting goals from Hap Emms, Ron Moffat, Doug Young, and Eddie Wiseman. Mush March scored both Chicago goals. By a Detroit account, the game was a “free-swinging battle” wherein “two fist fights and a free-for-all narrowly were averted;” referee Cooper Smeaton called 11 penalties. Chicago defenceman Roger Jenkins suffered a gash to a cheek that needed four stitches to close. Another Chicago blueliner suffered a worse fate: Billy Burch left the game with a compound fracture of the left leg after he went into the boards with Detroit winger Frank Carson. It turned out to be the last game of Burch’s distinguished career. At 32, he was playing his 11th NHL season. Starting in 1922 with the late, lamented Hamilton Tigers, he’d was a fast forward in those years, winning the Hart Trophy as the league’s MVP in 1925. When the Tigers sank, he went to New York, where he prospered as the first captain of the expansion Americans. He’d be elected, eventually, to the Hall of hockey Fame; 1930swise, the news was that he was back on skates again by the fall of 1933, trading in stick for whistle as a referee in the minor Can-Am League. 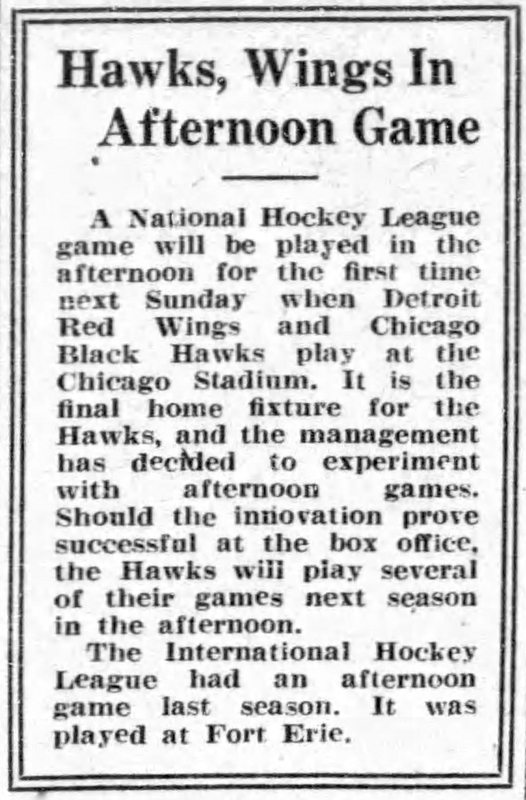 Also in the house in Chicago that March afternoon was NHL President Frank Calder. He was on a mission to investigate the conduct of Chicago coach Tommy Gorman who, five days earlier, had pulled his team off the ice in Boston, forfeiting the game to the Bruins after a dispute over a goal Boston scored in overtime. The latter wasn’t sudden-death at the time, so there was still some time to be played, or would have been, except for the fracas that saw Chicago players attacking goal judge, and Gorman exchanging punches with referee Bill Stewart. In the aftermath, Stewart ejected Gorman, who took his team with him; that’s where the forfeit came in. I don’t know that Calder took any further action, for all the fuss that was stirring in the days that followed. It’s possible Chicago was fined $1,000 for departing the ice; otherwise, the team’s punishment seems to have been to subside away into the off-season. A year later, the Black Hawks found a better way to end their season’s story when they made it all the way to the Finals, meeting and beating the Detroit Red Wings to take Chicago’s first Stanley Cup. Mush March scored the goal that clinched the championship. Hawks Asquawk: A Chicago crew of a slightly later vintage, circa 1938. From left, that’s Jack Shill, Carl Voss, Cully Dahlstrom, and Mush March making some noise.